After a long day, this plush, cozy recliner beckons you home to relax. Kick up your legs and enjoy the softly supportive, pillowed feel of the padded biscuit back and resilient, high density foam seat cushion. Additionally, this recliner model was specially designed to fully extend to a completely horizontal position with the gentle motion of a lubricated, heavy duty steel mechanism. 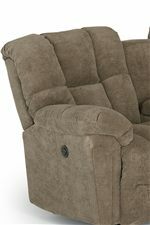 This recliner is available as a lift recliner, or rocker recliner. The Maurer Casual BodyRest Lift Recliner by Best Home Furnishings at Best Home Furnishings in the St. Louis, Chesterfield, St. Charles, MO & Waterloo, Belleville, Edwardsville, IL area. Product availability may vary. Contact us for the most current availability on this product. Welcome home to the plush comfort of the Maurer collection. These recliners and reclining sofas are bountifully padded with plump pillow arms and a padded biscuit back design to offer you the softest, most enveloping comfort imaginable. For the best recline available, our BodyRest reclining chairs extend to a full horizontal, flat layout position. Heavy duty frame and spring construction can hold up to 300 pounds for daily use. The Maurer collection provides functional, cozy furniture for the casual home, and each of these pieces can be customized to your exact specifications in a stunning array of fabric colors and textures. The Maurer collection is a great option if you are looking for Casual furniture in the St. Louis, Chesterfield, St. Charles, MO & Waterloo, Belleville, Edwardsville, IL area. Browse other items in the Maurer collection from Best Home Furnishings in the St. Louis, Chesterfield, St. Charles, MO & Waterloo, Belleville, Edwardsville, IL area.